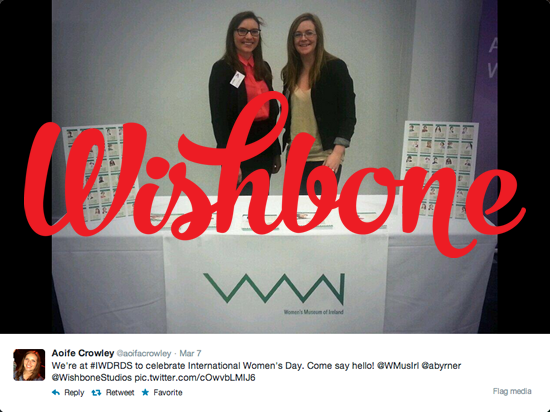 This week we’re checking out Wishbone Studios and shooting some questions to Aoife the founder. Aoife has worked with some well known events like Dublin Web Summit, rebranded by Aoife to The Summit and other events across Berlin, New York and San Fran. What struck me about Aoife’s company when she joined the community was how effective her site was, as a service based company she exudes what she can do, something a lot of companies miss. 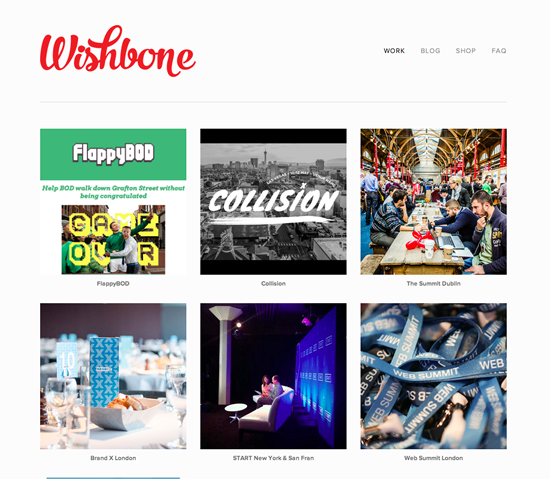 So tell our readers a bit about Wishbone Studios and what you do? 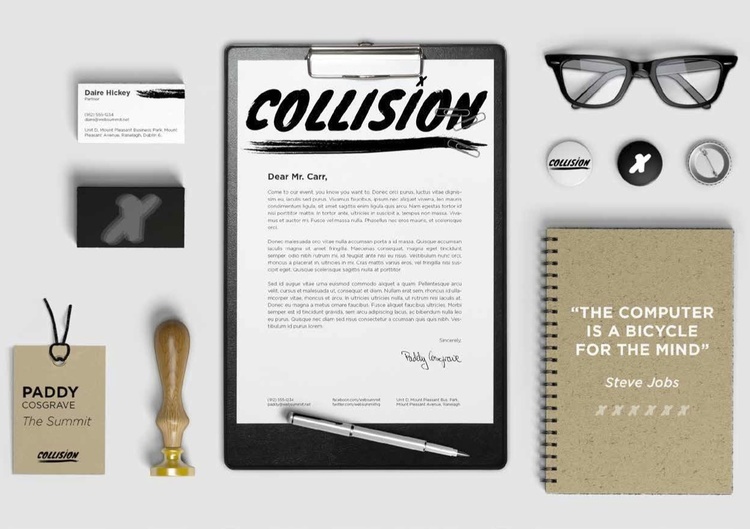 Aoife: Wishbone Studios is a Graphic Design agency. We specialise in branding and identity, which means crafting a logo for your company, as well as looking at the colours, typefaces and visual cues that communicate clearly what makes your company special. We also do all manner of print design, from wedding invitations to posters and billboards. In terms of print, our speciality is collateral for events – think lanyards, wristbands, signage, marketing documents and so on. We’ve worked on events as small as 100 people and as big as 10,000, so we’re confident we can deliver stellar service no matter the number of attendees in the room. We’re currently working on expanding our digital design offering. At the moment we do little things like google ads, slide decks & facebook ads, but in the next month or two we will also be offering full website design services. Watch this space! What are the starting points for companies looking to build brand? Aoife: A lot of business owners are so busy actually running their company that they don’t make the time to actively work on their brand identity. What some people don’t realise is that your brand isn’t just how it looks – it’s actually the whole personality of your company. It’s how it works, how you communicate, your tone, your vision and your values. If there are inconsistencies it can be quite confusing to your potential customers. For example, if you are marketing yourself as a friendly approachable company, but you send your emails from an address like “donotreply@mycompany.com”. What’s friendly about that? If you want to build a brand you have to start from first principles – what is my company offering, how is it different from my competitors, what words come to mind when I think of my company, what do I want to communicate with people, how do I want to communicate it? People get stressed about translating the answers to these questions into visuals, but that’s what you hire a designer to do. All you have to do is answer them. 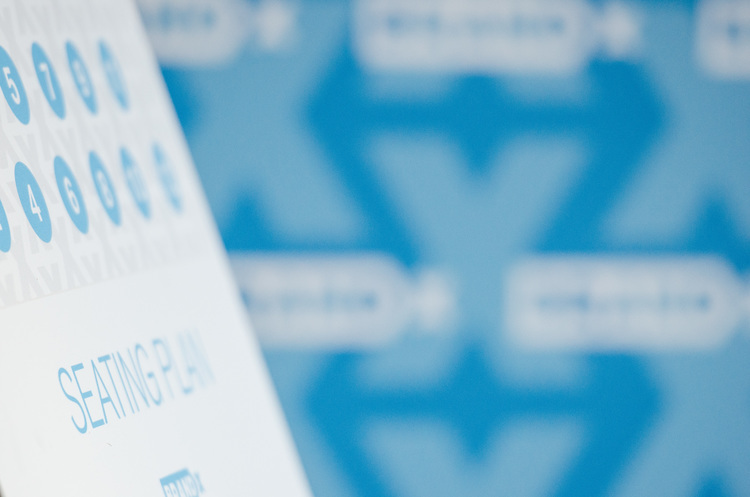 Talk about some of the risks/challenges you had to mitigate when rebranding the Dublin Web Summit? Aoife: We had a very tight turnaround time, plus we were keen to do something sufficiently epic to go with their massive growth. The Summit team felt that the old Web Summit logo no longer accurately represented what the event was all about. The identity was too corporate and bland. More importantly, the word “Web” didn’t describe all the new areas the team was developing, such as the food and night entertainment portions of the event. We developed a new logo and identity based around the ideas of excitement, passion and new connections. The new colour palette incorporates big bright colours, while the connecting “m”s at the triangle represents a meeting of minds. The Food Summit and the Night Summit’s logos were iterations of the core Summit logo. We kept the identity as fluid as possible to allow for further growth next year. We carried these ideas into the design of the event space. The use of chipboard and bright carpeting warmed up the space. We mixed up the signage, with a variety of wooden signs, foamex and hand-lettered chalkboards. We also added window decals for an unexpected pop of colour. With the stand artwork for over 900 exhibitors to create, print and install, we developed a templated system for collecting and approving all artwork. Do you think building brand in the online world should have a different approach? Aoife: Depending on the nature of your company, you can be a lot more casual in the online world when building your brand. Online gives you a much shorter window of attention, so play to that. Make topical things that will gain lots of traction today but may be defunct tomorrow. Don’t expect that it’s enough to build a website once and never update it. People online expect their experience with your brand to be tailored to their needs, so work on ways to break your customers into different categories and communicate with each category in a relevant way. Irelands a tiny market, you’ve worked with some international clients. What advice would you give to others looking to acquire international business? Aoife: I’ve got the majority of my clients through reputation and word of mouth. Treat every client as your most important client, be courteous and kind, create the best work that you can and invest time in upskilling whenever possible. It’s not easy but it’s more fulfilling that way. How do the American’s cope with the name Aoife, did you try an alias like Frank? Aoife: Nope no aliases, though it is a good icebreaker having what seems like a bizzaro name to most of the world. I do work with suppliers occasionally in China who refer to me as Mr. Aoife. What are the issues around running international projects, and what advice would you give? Aoife: Managing supply chains, foreseeing hidden costs and synchronizing schedules. All of the international projects I have been involved in have centred around print design, so I have managed the design, manufacture and delivery of physical products. There can be hidden costs with physical products. For example, there could be import charges if you are ordering from abroad, or delivery charges, rush fees etc. I am aware of when these charges can crop up and always let my clients know when there is a more cost-effective way to go about something. Synchronizing your schedule with wherever you are working is another big issue. Working San Fran hours from Dublin is not fun! But if you want to work with international business you have to be prepared to be awake when they are. You’ve done lot of tech events and you specialise in event collateral, do you try and link the offline world with the online world? Aoife: Although the work I have done on tech events centred on branding and event collateral, I was always conscious that the brand had to work both online and offline. I worked out colour palettes that would work both in print and on screen, fonts that rendered in a browser as well as they printed and logos that would be effective both on a tiny sidebar Google ad and six foot tall on a stage. You have to consider all the use cases when creating a new brand. Do you think a lot of Irish companies fail on branding? Aoife: I don’t think “fail” is the right word, but I think some companies don’t give attention to branding or don’t understand why branding is important. An effective brand offers a differentiator for your company, creates loyalty among your customers, and allows you to command a price premium for your product or service. An investment in your branding pays for itself. 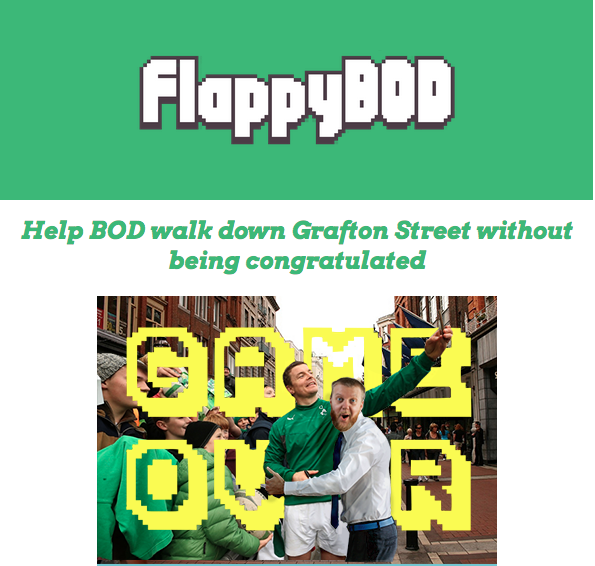 Tell us about Flappy Bod, and how well it’s gone? Aoife: I put up flappybod.com yesterday, which has exploded all over the internet. It was just a little side project that I was expecting maybe four of my friends to play. Last time I checked, nearly 15,000 people have played it and it hasn’t even been live a day. Needless to say my server is upset so I’ll be rectifying that this afternoon. Aoife: Another side project I worked on coming up to International Women’s Day was a set of Top Trumps style cards depicting strong, interesting women from Irish history. Some of them are pretty obscure, and then there are the well known faces like Maeve Binchy and Constance Markievicz. You can get a set on my Wishbone Shop. I think it’s important to work on side projects. It’s a great way to upskill and find like-minded people.